Our Cooking Class in Puerto Vallarta with Rosie's Cooking Vallarta. Visitors to Puerto Vallarta usually come for the sun, the beaches and, of course, the colonial charm of the old town. 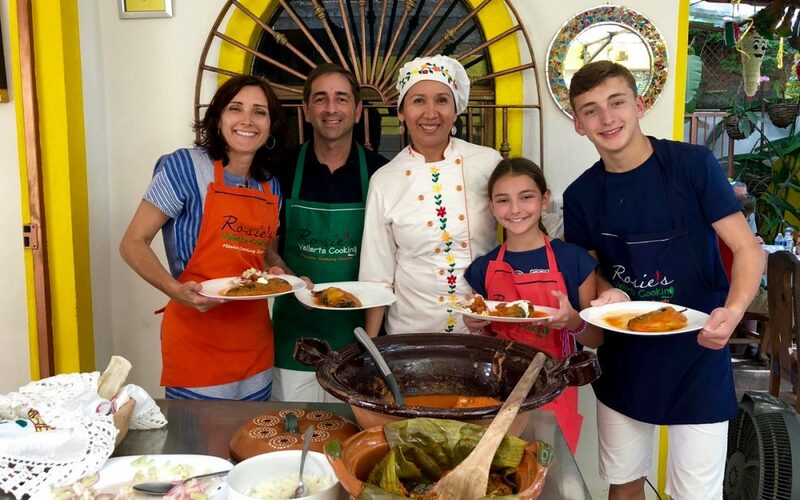 Because I love cooking, not to mention Mexican food, I had another must-do for our recent vacation to Mexico: a family cooking class in Puerto Vallarta to learn how to make a few typical Mexican dishes. I happen to be a big fan of taking cooking classes whenever we travel. You can learn so much about the place you visit by sampling local food and better yet… learning how to make it. Over the years, our family has taken cooking classes in Italy, Costa Rica, Colombia, France, even Bali, Japan and French Polynesia and we have always had so much fun. 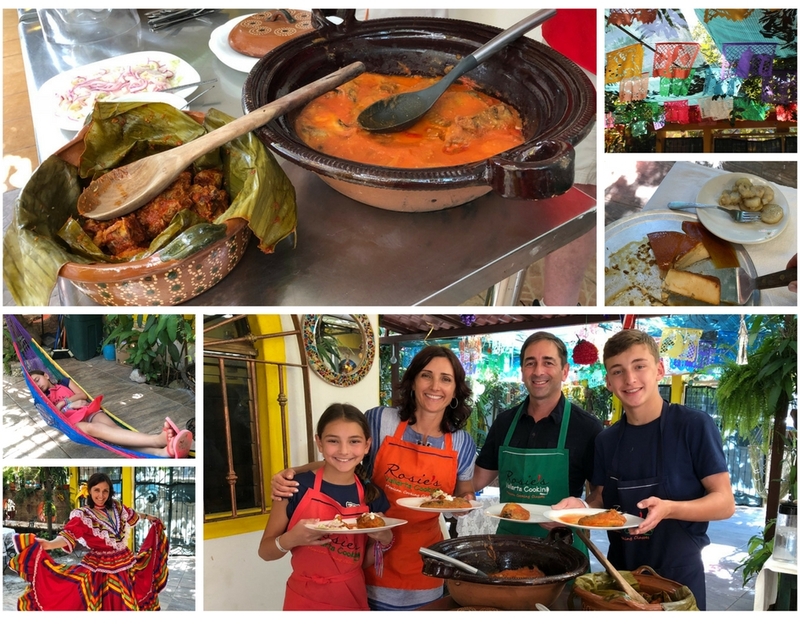 Food and culture are very tightly woven together and our cooking classes have allowed us to travel deeper and better understand the places we visited. Fast forward three weeks. 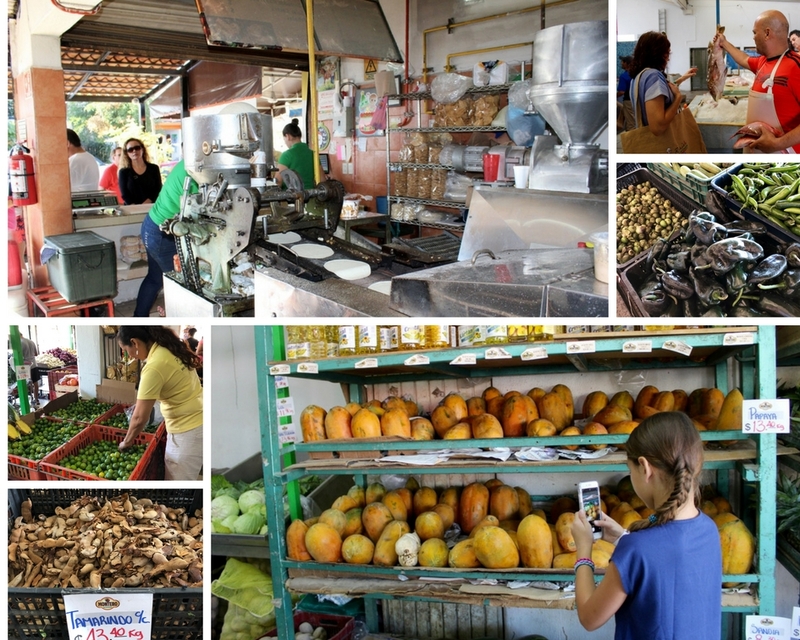 Our day with Rosie’s Vallarta Cooking started with a visit to an authentic Mexican market. Rosie told us this was where she shops daily for ingredients she uses in her kitchen, class or no class. Totally my kind of place and something we would not have found on our own! First, we stopped at tortilleria, a mini tortilla factory, where we picked up some masa, a key ingredient for the home-made tortillas we would be making shortly. Next was the fish market to get bonito for the Vallarta-style ceviche which was also on the menu. We got a nice lesson on different types of tuna from one of the fishermen. I had no idea that Vallarta-style ceviche is different from the one I was used to. It is made with finely minced boiled fish as opposed to big chunks of raw sea food “cooked” with lime juice. Our final stop was the produce section of the market where we browsed for a while and purchased several vegetables and spices. 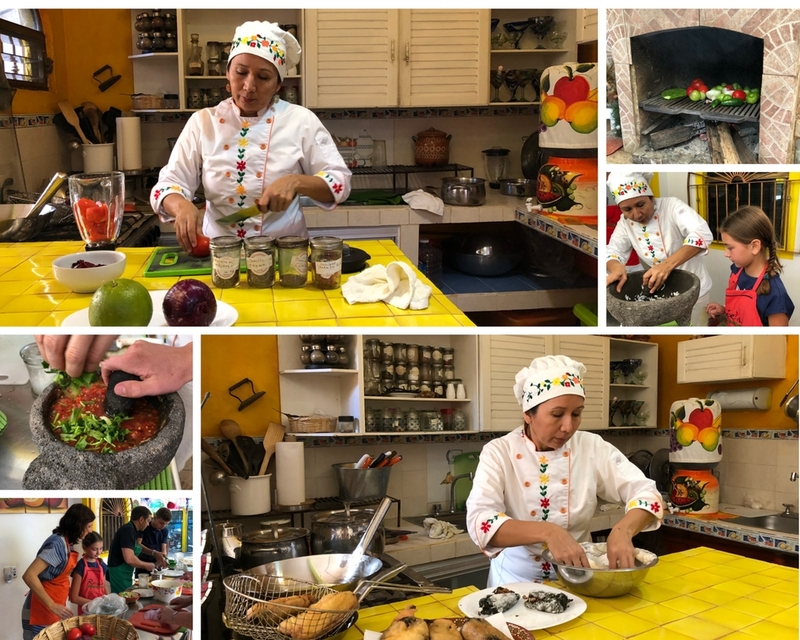 Rosie told us how to pick the best limes, showed us several different peppers, from mild to fiery hot and explained the use of several dried herbs in traditional Mexican cuisine. First things first: a visit to the local market. Once we arrived at her house, Rosie introduced us to her family members, gave us quick tour of her home and showed us some of the trees and plants that she planted in her front court yard, including a vanilla tree that produces the beans she uses in her kitchen. She served us a delicious and refreshing hibiscus iced tea made from the dried flowers we purchased at the market. It all felt like a visit to a friend’s house. After we washed our hands and put on our colorful aprons… orange, the color of adventure, for @passportsandspice, of course… it was time to get to work! We spent the next few hours making guacamole, chips from scratch, Vallarta-style ceviche, chile rellenos (stuffed peppers) with both meat and cheese fillings and cochinita pibil. It was clear that Rosie loves her job. She was totally in her element, leading the way with explanations and demonstration that we observed and tried to copy. We also made homemade tortillas from the masa we purchased in the morning. Our kids had a blast pressing their balls of masa into tortillas and handing them to Archie, Rosie’s husband who was toasting them on a plate heated by a wood burning open fire. Our kids loved participating in the food prep, especially making tortillas. Of course we also made postre (desert). As if one could take a Mexican cooking class and not make flan?!? We sampled as we worked and after polishing off our final dishes and desert, we were so stuffed we could not move. Siesta time! 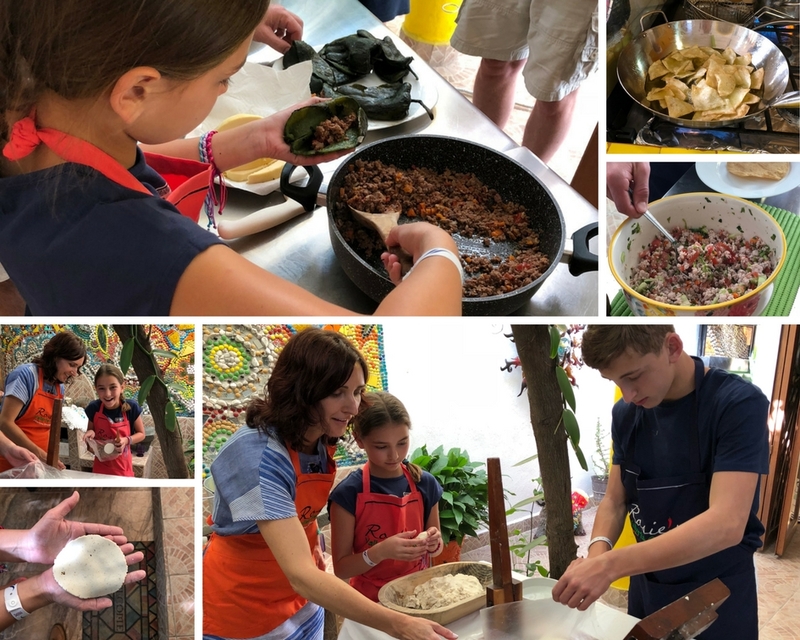 Aside from the food prep, we enjoyed chatting with Archie, one of Rosie’s daughters and her neighbor (who was assisting in parts of the class) and learning more about the regular, non-touristy life in Puerto Vallarta, Rosie’s family history and her aspirations. Rosie also shared that she was super excited to become a Grandma in a few short weeks. The finished product and happy, stuffed customers! In case it wasn’t obvious, I highly recommend Rosie’s Vallarta Cooking if you find yourself in the Mexican state of Jalisco. All four members of our family officially rated it as the highlight of our vacation. 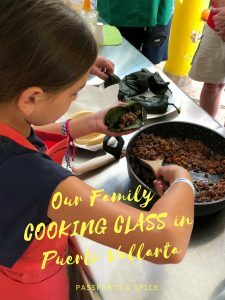 Our family cooking class in Puerto Vallarta was so much more than a cooking class. It was an awesome cultural experience, great family bonding and so much fun. And yes, we made and ate some fantastic homemade Mexican food, too!